The Rockport Film Review: Phillip Seymour Hoffman Tribute "The Savages"
Phillip Seymour Hoffman Tribute "The Savages"
Not to be confused with the 2013 Oliver Stone movie "Savages", 2007's "The Savages" stars Philip Seymour Hoffman and Laura Linney as brother and sister dealing with their aging father. The story is all too familiar to some as the baby boomers continue to age it's up to their children to care for them. The film is written and directed by Tamara Jenkins in a very honest and sincere way that will resonate with many people. We start out in the warm and sunny senior utopia of Sun City, Arizona. Lenny Savage, played by Philip Bosco, is the elderly antagonist in a story that starts out with a "bathroom incident". Not too long after that his girlfriend of many years literally drops dead. Since he was living with her and her kids can't stand him he is kicked out to fend for himself. His daughter Wendy Savage lives and works in New York City as a struggling author and playwright who is having an affair with an older, balding, and more importantly married man. Her older brother John Savage lives in Buffalo, he writes, teaches, and has a Ph.D. in philosophy. Both siblings are single and muddled in mid-life crisis territory when they receive a call to come and do something about there estranged father. Lenny was a terrible father and their mother left the family when they were little, so it is quite amazing to see how relatively normal Wendy and John turned out. They meet at Wendy's place, then board a plane to Sun City. Lenny has dementia and is pretty dependant on others so they make the big decision most people dread. They have to choose a nursing home where they prey on peoples guilt. Wendy asks John "Are we horrible people?" They each deal with things in their own way. Wendy feels enormous guilt, while John can only think of what his father did to him as a child. Can he forgive the abuse? Are they doing the right thing? 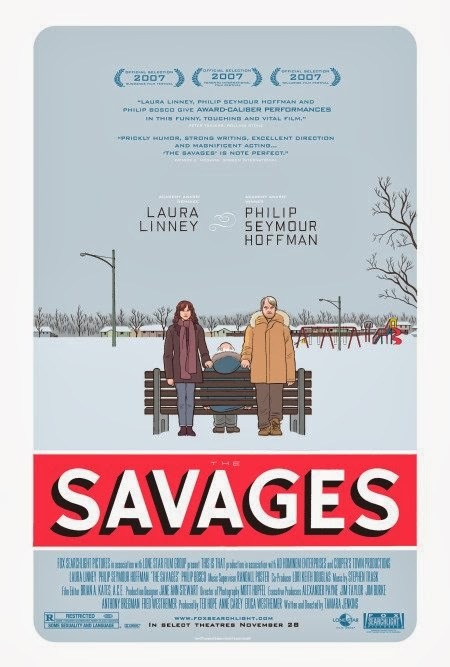 "The Savages" is also darkly comedic. The indignities of getting old and the many awkward moments that ensue. While bringing Lenny back to New York, they have quite the embarrassing moment on the plane. Later on, at a coffee shop, they have a very tough and awkward conversation about what to do with him when he eventually dies. The film is a rare and realistic approach to death and how it affects the living. It forces Wendy and John to get together and work out there problems which eventually brings them closer together. 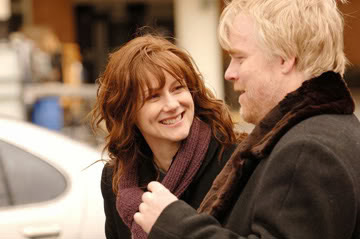 Philip Seymour Hoffman's performance earned him the Award for Best Male Lead at the Spirit Awards, while Laura Linney nabbed an Oscar Nom for best-supporting actor. Tamara Jenkins also got a nod for best screenplay.